Book any 7 night Saturday to Saturday stay during Summer and save $500! Book your 7 night, Saturday to Saturday stay by August 31 and save $600! Newly Renovated! Check out our reno in our pictures! Save Big on your ski trip next year! Inquire now! Please email or call for a more detailed quote and discounts. The 7th night is free except Holidays. On the Blue River in the historic mining town of Breckenridge, our charming three bedroom, 2.5 bath 'Blue River View' has been designed to create a warm, welcoming home for skiers. Our home is a duplex located on a private, wooded acre of land with views of the TenMile Range and Baldy Mountain, overlooking the Blue River, beaver ponds and our own large private pond just steps from the back door! Our location is the Warrior's Mark neighborhood in Breckenridge, an easy 10 minute walk on the level to Main Street and the Quicksilver lift. The FREE RIDE Breckenridge shuttle stop is 3 houses up Broken Lance from our home. The Blue River View sleeps up to nine people very comfortably. Everything is provided to make your stay a memorable occasion. The main floor includes a living room with 40' flat screen HD Cable with DVR, dining room with wood burning fireplace, kitchen and powder room. Off the kitchen is a large private deck with gourmet stainless gas grill, great river and mountain views and comfortable patio furniture. A charming log stairway leads to the second floor with king bedroom, queen bedroom and bathroom with oversized shower and separate vanity room. The lower level large bedroom sleeps five with two twin beds, a day bed and trundle, and a single sofa bed. There is a bathroom with shower. A door opens to the private patio and garden furniture overlooking our private pond and the Blue River. Say Goodbye to the hassle of keys! Our home uses a keyless entry system making it more convenient to access the home for you and your group! Plus no keys to return after your stay! Your hosts, Hap, Margaret & Sarah Henderson, enjoying one of our favorite picnic spots just a short drive from our Blue River View. For over a decade we have been hosting ski groups in winter and family reunions in summer. We enjoy skiing in the winter but summers in Breckenridge are even better. We had been renting vacation homes in various parts of Colorado each summer and when we had an opportunity to purchase this home on a large lot with a pond and river frontage in town, we jumped at the chance. Our home is an easy walk to Main Street or just hop on the shuttle two doors down. We are the only home in town with a private fishing pond in addition to private river frontage. Hiking and mountain bike trails are nearby and the lifts at Peak Nine are also closeby. Enjoy our private pond and river! Listen to the waterfall as you relax on our wonderful deck. 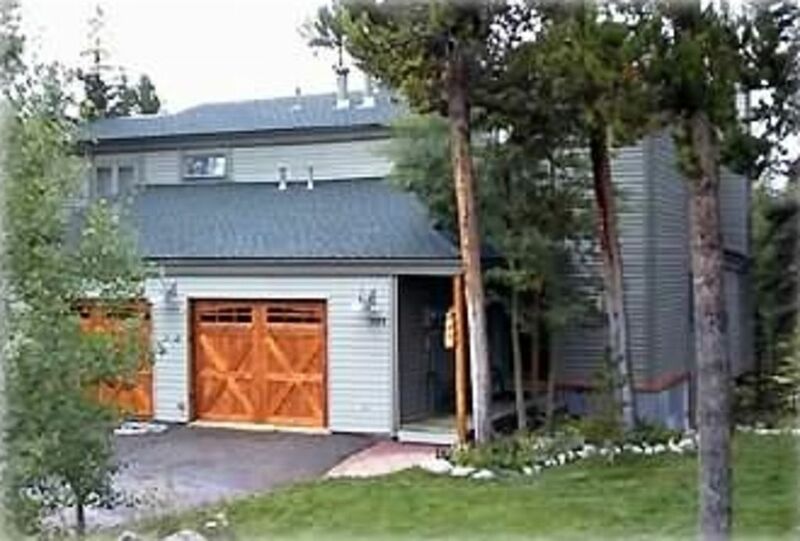 If you are looking for a cozy place conveniently close to everything in the town of Breckenridge look no further. The location itself allows you to park your car and enjoy the town without driving. Free bus transportation and a bus stop 3 doors down. The owner was so helpful. Truly is a home away from home!!!! We had such a great week exploring Breckenridge, and our location couldn't have been better - the house was perfect for our family of 5 plus a dog... the river access in the backyard was probably one of the all-time favorite spots for all of us! The bus stop just a few doors up made getting around a piece of cake but we were still close enough to walk to Main Street as well. Looking forward to our next visit! Good size cabin for two families, lovely views, right on the brown shuttle route straight to the runs! This place is an amazing location, it’s spotless and has a lot of room for the family. We were able to ski and enjoy warm cozy nights. Everything you want while away from home. Enjoy. Great location and floor plan. It had everything needed to make it an enjoyable stay. This place was everything my group needed and more. It boasts a full kitchen and enough beds for a large enough group that its cost makes it a steal. It even ended up having the surprise feature of being two houses down from the bus stop. We were able to hit the lifts and carry all of our gear on person. Will be renting again.